This past Thursday Josie turned 2 and 3 months old. We’ve been busy lately traveling and so her usual routine has been uprooted a bit but she’s still held on to a bunch of constants. The biggest difference have been her language skills, even though its hard to quantify not being a child development specialist myself. She’s been using some complicated sentences in my opinion such as “I want you to open this side, but not the other”. She has dropped her old habit of saying ‘my’s’ for me, my I, etc. She mostly uses the right word and she has started correcting herself when she is using past vs. present tense. She can say her entire name now too and now understands the major question words (what, where, when why, how) that used to elude her. Everything that happened in the past though continues to have happened ‘yesterday’ despite it being actually yesterday or three months ago. 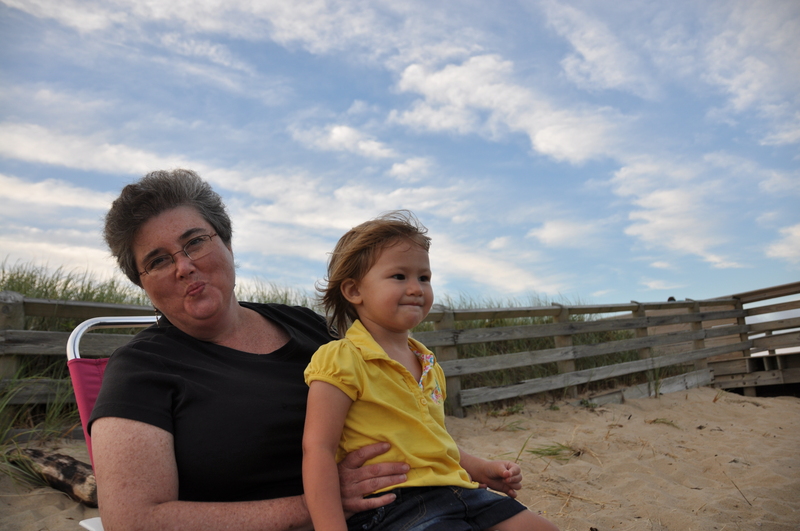 Her memory is seriously that good that she will remember things that haven’t come up in months. It’s very helpful when asking her where she put things (like puzzle pieces she now thinks are funny to hide). Physically she’s running lots. I’m trying to get her walking more and more, but my tolerance for the heat this summer has thwarted that idea a bit as I don’t want to walk anywhere or be out in the heat any longer than I have to! She loves to jump up and down to the ‘up and down’ song from Yo Gabba Gabba. Her favorite toys right now are her puzzles (24 piece ones most popular) and human-analogs to pretend with. 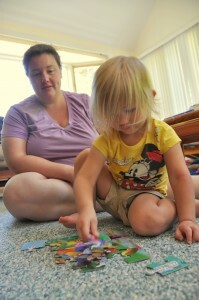 She has amazing focus on the puzzles and once she’s done them a time or two with us she can do them alone. She loves to play with other kids and is amazingly social (except when doing puzzles). Today at the mall a girl of maybe 6 or 7 came up to her and said ‘hi hi!’ and waved at her before walking away saying how cute Josie was. Josie was a little shocked but then immediately chased after the girl and grabbed her hand and walked half the mall holding her hand. Jordi and I walking behind in amusement. She was not pleased when we separated ways. She’s a big fan of older girls but plays well for her age with kids her own age. 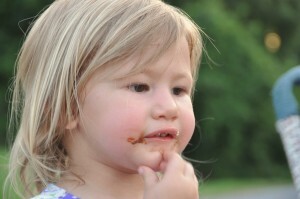 She will most always use her words (loudly) with statements like ‘It’s my turn now!’ when someone grabs or ‘I want it!’. She told Bronwyn the other day ‘Don’t push me!’ after being shoved. I’m so proud of my assertive girl, it’s hard to find that balance and not be aggressive or a doormat and I think she’s getting the idea. Unfortunately other kids (and Josie) don’t always exactly listen to their friends, I often end up repeating what they said to point it out to her. Numbers and letters have been especially fascinating to her lately and so we’ve been trying to point them out more. She can count to ten reliably and then after that a few start getting lost, but she counts in increasing order, just missing a few or 8 numbers in a row. I’ve been reading probably an hour and a half to her throughout the day, she’s an avid listener and it’s nice for me to get some time sitting. In her art, she enjoys markers a lot now. This week we got the first demonstration of her understanding the idea of coloring books when she colored one color in the general vicinity of each part of the picture/characters. Physically she’s been growing like a weed although I don’t have exact stats. She’s put on at least 2 lbs in the last two months, might be almost 30 lbs now. With the pool in our backyard we only made it to the beach a couple of times for a full beach day, but we took a couple of evenings for dinner or after to go play on the beach in the cool night air. 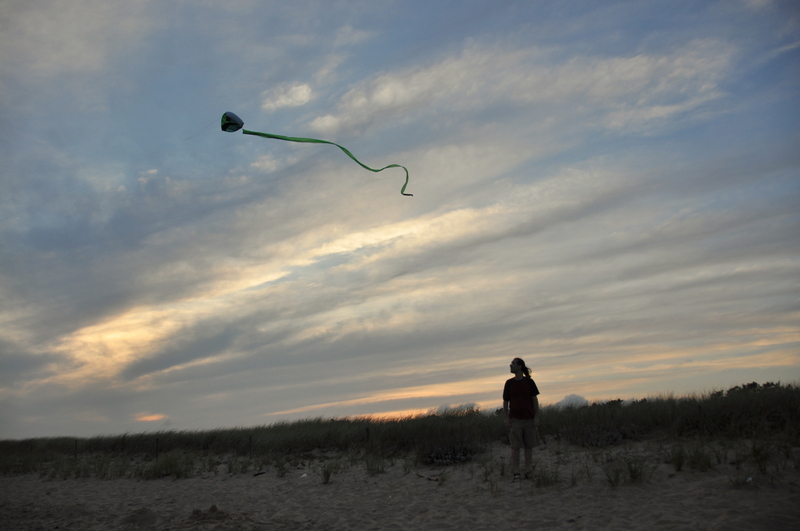 It was a great time for flying kites and for going to the ‘resident only’ beach that we hadn’t bothered to get passes to. 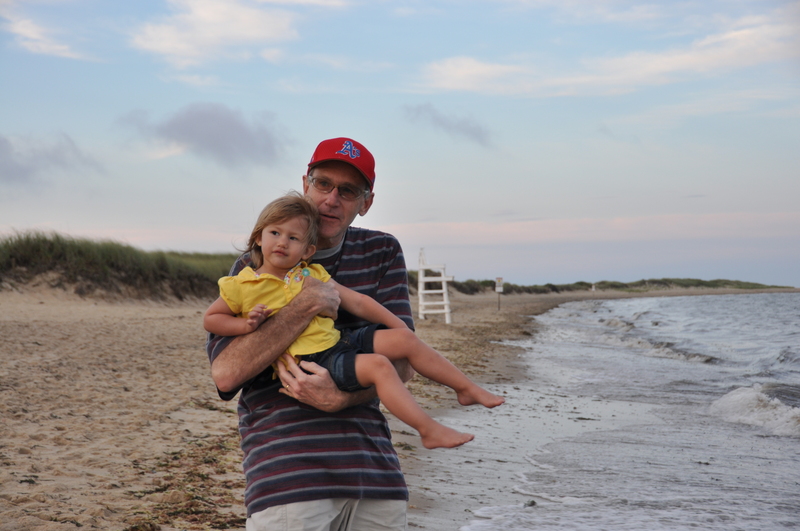 These photos are from South Cape Beach, which wasn’t a favorite as it had a lot of sea-weed at the time, but the guards implied that it was an infrequent event. Josie loved to be bounced around and dipped into the water, to the detriment of her grandparents backs. 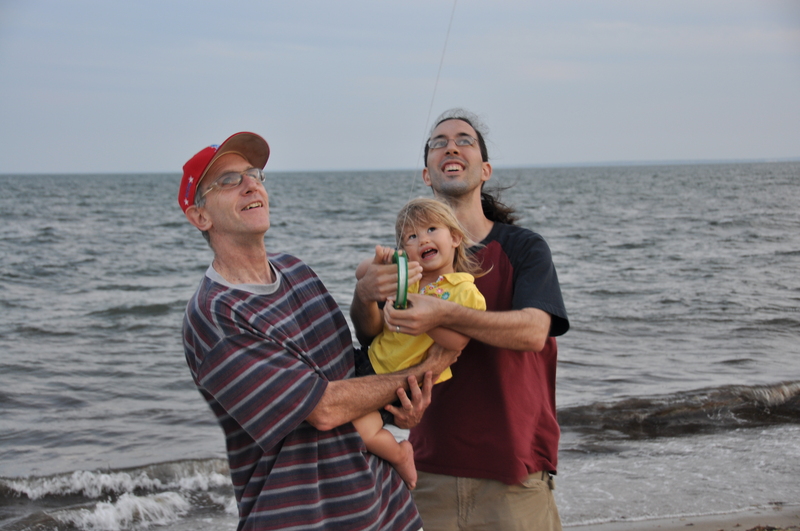 Flying the kite, we need to get one that won’t cause rug burn on Josie’s hands for next year if we were to just give it to her. This one the wind would have taken away and spun in her hands. Now I’m just having fun with my camera and trying to be artsy. Yum, nothing beats an ice cream cone on a hot summer day. This may actually be the first one we just handed to her and let her eat. 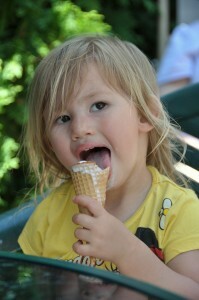 The back porch was an easy cleanup spot and we all enjoyed a cone after our morning swim. She could use some work on her technique, it was melting faster than she could eat it. Ethan and Zach did not have the same problem, theirs were gone lickety split. 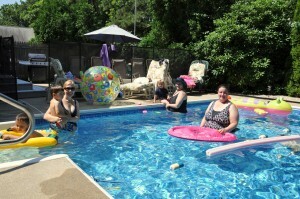 Swimming! 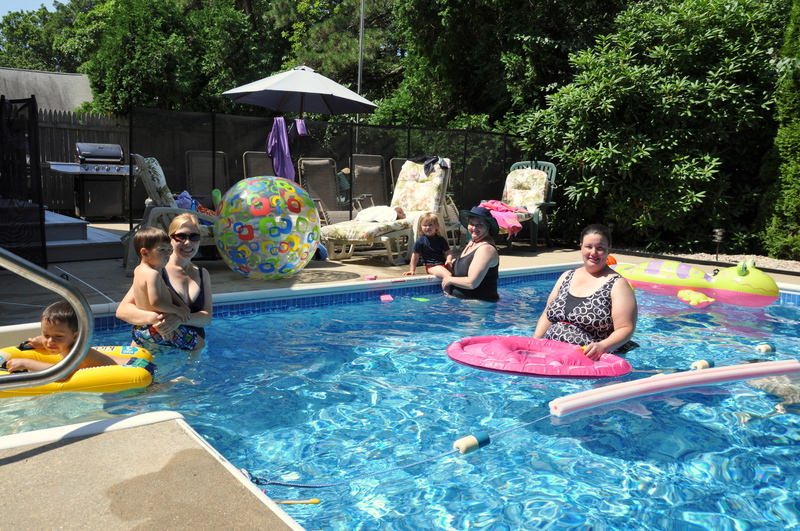 Our house in Cape Cod had a pool and we went in it most every day. The water was warm and felt good compared to the heat wave. It’s sooo convenient to be able to get wet without also getting sandy and having to drive somewhere. Josie somewhat liked the water, but also liked to torture us by walking around the outside of the pool while we were in it and refusing to get it. This pool also had a really steep dropoff past the 8 ft wide shallow end. 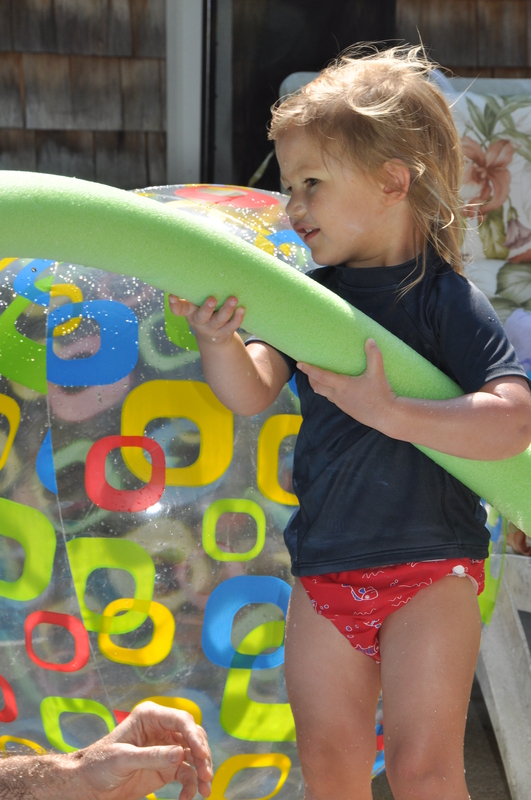 She got more familiar with it as time went by but her favorite activities remained throwing the beach ball animals into the pool and washing the lizard inflatable with a sponge. She also liked the outdoor shower where we’d hose her down afterwords with some warm water. One day our friends and neighbors Christina and her two boys came down to visit us from home and spent the morning in the pool with us. Ethan (age 4.5) had a blast, Zach was a bit more cautious but got into it by the end. Jordi somehow didn’t hear the ‘no pictures while I’m wearing a swimsuit rule’ and did take a few. I think they are determined to make only two kinds of maternity swim suits, ugly, and uglier. I went with ugly, although some people seem to like it, it just gets the job done so I can enjoy some time in the pool. I can still wear my regular tankini but it’s getting less comfortable now at 30 weeks along. Josie has become obsessed with puzzles lately. She is currently mastering every 24 piece puzzle we give her (which are conveniently dirt cheap at dollar stores) and wants to do them again and again and again. We spent a significant amount of time on our Cape Cod vacation doing the two puzzles we brought. She wanted to do each of them with different people, and the minute she finishes she tears them apart again. Unfortunately she’s also taken to pretending to hide a piece and asking us ‘where is it!?’. That backfired as she did it on the morning we were leaving to Chad’s wedding in PA and couldn’t find a few pieces and so that puzzle was left at home. Lucky for her, we picked a random Indian/Pakistani buffet for lunch which was directly next to a dollar store and I grabbed two more puzzles for her. We’ll have to move up to the 50 piece ones soon to give her some more challenge! Here’s a little video of Josie running the bases at the previously mentioned game. Sorry for all the people who liked to keep getting in my shot. She liked to run fast, but then just wanted to play with the dirt. Then some kids would come by and she’d join in the pack. I have to imagine her legs were sore the next day, but she didn’t mention it. She also did all this running after eating a slice of pizza, a (veggie) hot dog, and an ice cream. Dinner of champions of course. Baseball! 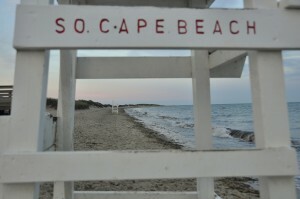 We spent a great week on Cape Cod last week renting a house in Mashpee. 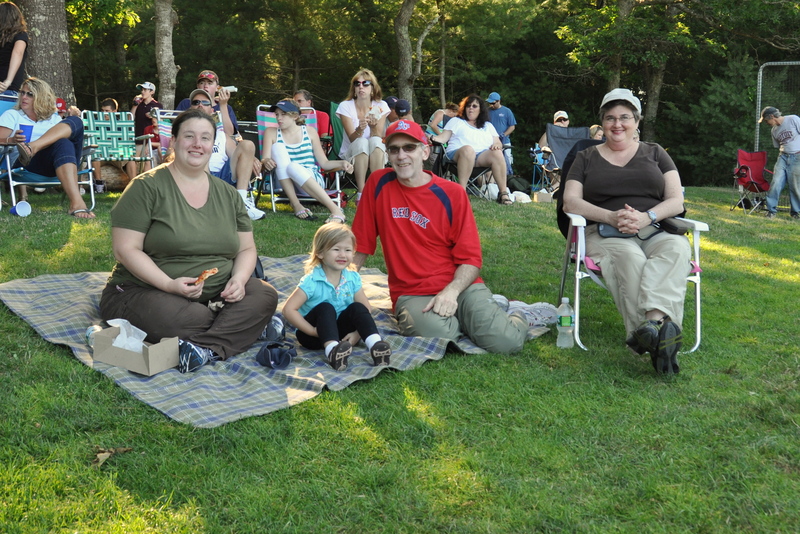 The second day we were there we caught a game of the Cape Cod Baseball League. 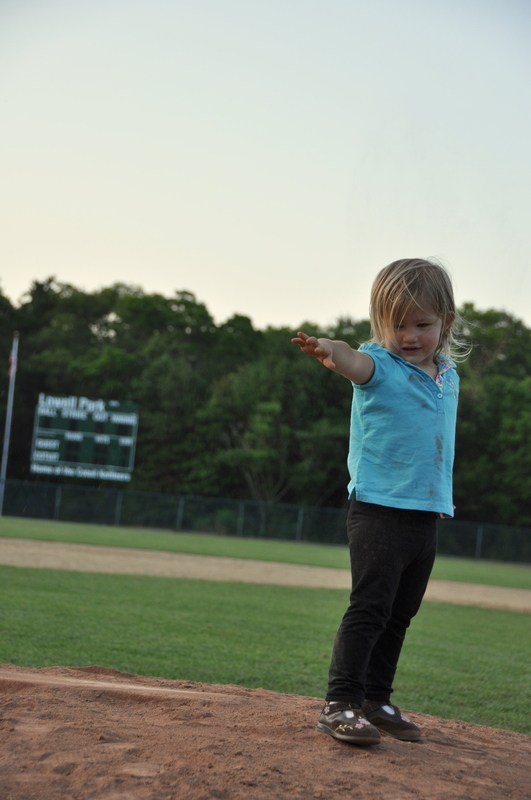 Josie spent most of the game eating and then running back and forth — later she went out and ran the bases, 3 times. Josie has gotten into the rhyme and finger play of ‘here’s the church… etc’. Here’s her version of it, plus what she thinks of Jordi’s description of it all. Maybe if we’re lucky (?) 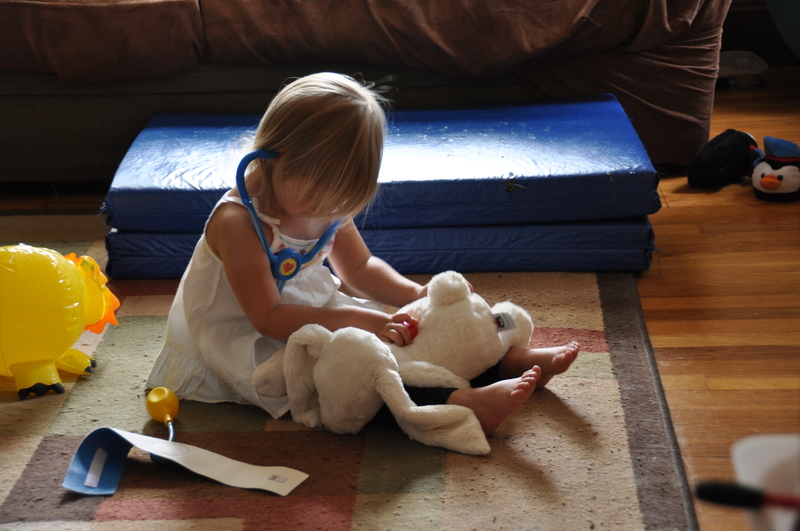 Josie will grow up to be a doctor. She certainly likes to examine her animals and her friends when they cooperate. She also reminds us still on almost a daily basis that she does not want her blood drawn again like they did at her 2 year visit. You are currently browsing the JenJordi.org weblog archives for July, 2010.